A box of Heavy Duty Hefty Cinchsaks. I’ve run various scenarios with sunscreen, a glue gun and a water filter. But I realize I’ll have far more staying power with plastic. I can use the garbage bags to make a poncho, a purse and even a pillow, and they will keep my food, iStuff and off-season clothing safe from the wind, water and wild animals. I’m know! I’m soooo right! If you think about it, the only invention that ranks even close to the wheel has only been around about 100 years. And plastic has been a game changer for both the planet and the human race. It certainly makes parenthood easier, and is probably why we are facing a population explosion. Wooden high chairs splinter and metal swing sets rust, but plastic pacifiers keep babies from being tossed with the bath toys. But as demand for convenience has led to billions of bags, bottles, products and packaging being consumed every day by parents and non-breeders alike, our landfills and oceans are filling up with plastic, and there are daily updates on the concerns for not only marine life, but human health. Disposable convenience is now an accepted and expected way of life. When my first child was born in 1997, cloth diapers were as extinct as the milk man. But when I realized that even generic urination costs $.25 a squirt, I attempted to manage my budget with the old-fashioned cloth supplies. And after a few weeks of diaper rash, toilet trash and poop in my washer, I decided that these were not the pennies to pinch. A few years ago, I made the switch to reusable shopping bags. 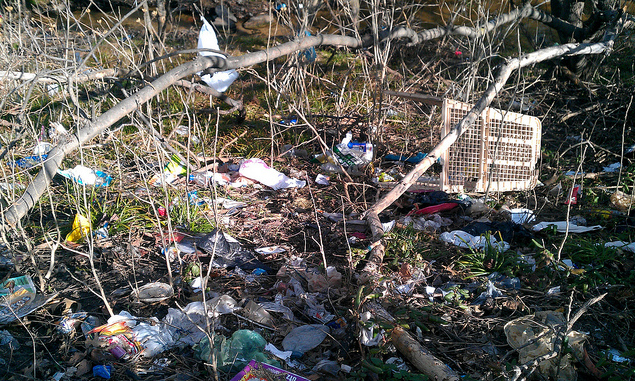 The average family collects 60-100 of these cheap plastic bags a week. And as they can’t be profitably recycled like other plastics, they end up in landfills and make their way to the oceans, where currents have created huge mountains of trash. 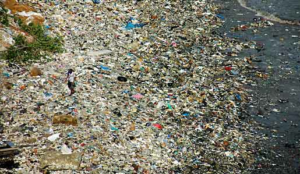 There is one in the Atlantic known as Garbage Patch Island, which is the same size as the state of Texas. As a concerned citizen of the planet, I dutifully use my bags (whenever I actually remember to bring them into the store.) If I forget (often), I punish myself (and the people behind me) by leaving the cashier to run back to the car. I’m hoping that making a scene inspires others to do the same. But the consequences of disposable karma might come full circle quicker than expected. My vegan diet has been on trial in the last two years as I’ve struggled with some health concerns that include hair loss, cavities and chronic bloating. And while the stress of moving, divorce, and 4 busy kids is not inconsequential, I have learned that, surprise! even high quality, organic foods can deliver contaminates if they are stored and especially cooked in plastic. Despite my clean diet, a recent hair analysis showed higher than zero levels of several toxins and heavy metals. The problem with plastic is that it’s made from petroleum and not meant to be eaten. And while I don’t eat plastic, my food is often wrapped in it. There are many ingredients in plastic that are toxic, linked directly to cancers, birth defects, hormone and autoimmune disorders, and childhood developmental issues. To name the biggest offenders, Bisphenol-A (BPA), phthalates, dioxins, and heavy metals cadmium, mercury and lead can be found in many of our bottles and food packaging. But since plastic isn’t a food product, manufacturers are not required to disclose the secret ingredients that strengthen, color and define their privately patented formulas. And as most of us use re-use plastic containers in creative “off-label” ways, we can inadvertently be exposed to toxins that create disease. So in my attempts to go green, I’ve exposed myself and my family to even greater risk! I cringe to think of how many summers I refilled the disposable water bottles for my kids…storing them in the hot garage and leaving them in strollers and cars from season to season. I was on a budget and a mission to live sustainably. But the problem with plastic is that they ALL can leach when exposed to heat and light of various degrees. When plastic is exposed to the elements, especially sunlight, heat and water wave action, it degrades into smaller pieces. These toxic particles then contaminate our soil and water, and act as sponges for other organic poisons such as the pesticides and fertilizers that run off of farms. Plastic pollution is breathed by marine life, and eaten by land animals, where it lodges in digestive tracts, circulates through blood streams and even mutates DNA, compromising not just one generation but future offspring as well. So eliminating fish and other meat from our diets, and drinking only the best filtered water might be pointless. Because we live in a plastic-wrapped world where today’s convenience is tomorrow’s garbage. I guess that’s just one more reason why I’ll be a Survivor with my chosen Heavy Duty Hefty Cinchsaks…. Thanks for the article. We decided to reduce our plastic consumption a few years ago. It has been challenging and Aldo rewarding. We’ve become friends of glass. Thanks again for the inspiration. We are on the same wavelength. I also am trying to use only recycled bags at the grocery and am also practicing a mostly vegan diet for my health. I am sorry to hear about your toxin issues. That is hard. I also did not like the idea of refilling plastic bottles. We did that for a while, just for convenience, but then I started buying a few glass bottled drinks and then removing the labels and refilling those instead. We’ve done it for about a year now and we really like it. The lids actually start to rust after a while (we wash ours in the dishwasher between uses), but overall it lasts quite a long time. Just a suggestion!